Gender inequality is a key structural driver of the HIV epidemic in South Africa. Young women between 15 and 24 are four times more likely to have been infected with HIV than young men of the same age. It is with this in mind that the Department of Basic Education (DBE) launched the Keeping Girls in School programme. Phases I and II of KGS are funded by the Global Fund. NACOSA (the Networking HIV/AIDS Community of South Africa) is the principal recipient, while MIET AFRICA, as a sub-recipient, is responsible for implementation in various areas. KGS and the related Sexual Reproductive Health (SRH) programme are part of the Global Fund’s Young Women and Girls (YW&G) Programme. 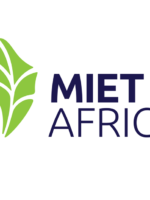 MIET AFRICA is implementing KGS and SRHP in three provinces—in the Gert Sibande and Ehlanzeni Districts in Mpumalanga, in the Zululand District in KwaZulu-Natal and in the Greater Sekhukune District in Limpopo. The programme is being implemented in 50 selected Quintile 1–3 schools in each district, targeting the most vulnerable girls, aged 14–18. (Female learners are targeted because of teenage pregnancy and their heightened risk to HIV infection.) Girls are to receive a combination package of services that includes peer education, health education, homework assistance, home visits, and career jamborees for Grade 9 learners. 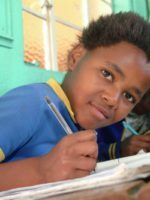 MIET AFRICA implemented the pilot programme in 286 schools in three provinces—the Eastern Cape (59), KZN (168) and Mpumalanga (59). Forty thousand girls in Grades 7 to 9 were targeted, with the focus being to strengthen schools to support girl learners academically, emotionally and socially so that they remain in school until they complete Grade 12. The programme employed out-of-school youth in a variety of ways to support girls to stay in school. For example, some were used as homework tutors to help girls academically, while other facilitated health sessions on topics such as puberty, pregnancy, HIV and SRH. 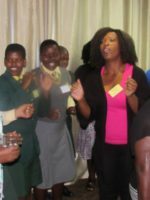 Another facet was career jamborees that were organized for all Grade 9 female learners in the selected schools. In total, 51 668 girls in Grade 7–9 were reached during the grant period, which ended in March 2016 and was succeeded by Phase II.